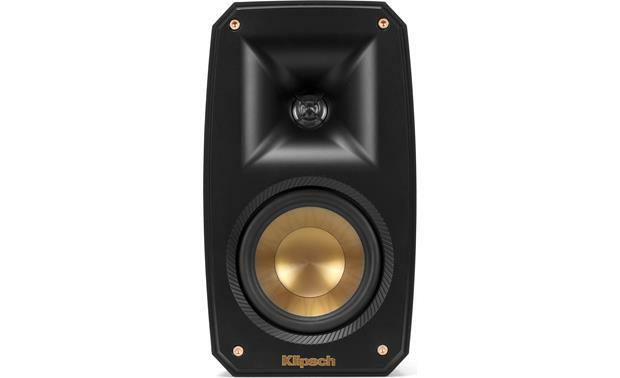 Klipsch has delighted our customers with their diverse range of Reference Series speakers for years. 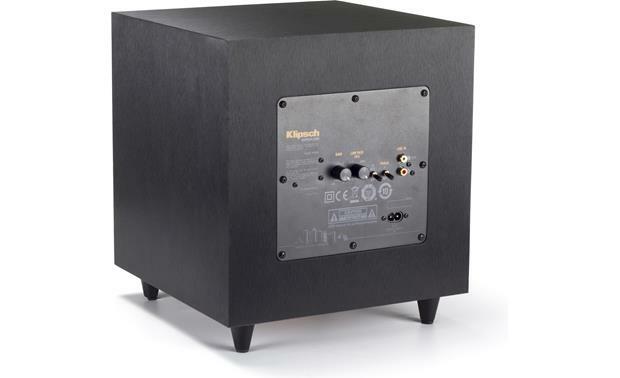 Klipsch has delighted our customers with their diverse range of Reference Series speakers for years. Now they've woven their tried-and-true sound into a compact home theater system that's perfect for small- to medium-sized rooms. My favorite part? 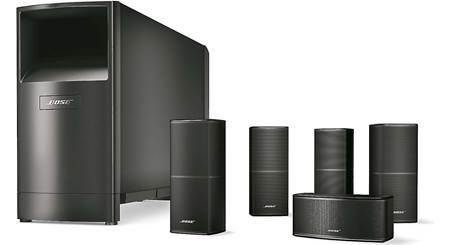 This 5.1-channel system includes a wireless powered subwoofer, which makes getting great bass in your room just a little bit easier. The Klipsch Reference Theater Pack provides outstanding 5.1-channel surround sound without taking up much space in your room. 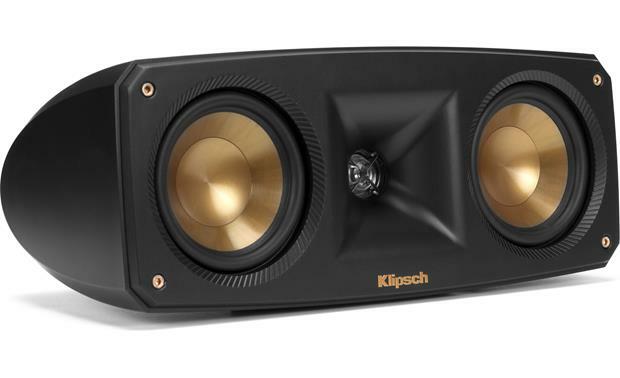 Klipsch's signature comes, in part, from their horn-loaded tweeter design. Flared openings in the speaker cabinets project sound waves toward your listening area, boosting dynamics and efficiency. All five Reference satellite speakers in this system use a Tractrix® horn design for a wide sweet spot and precise spatial imaging. You can easily spot Klipsch Reference speakers by their copper-spun woofers. But these drivers don't just look cool: they deliver smooth, articulate midbass for music and movie soundtracks. The left and right speakers in this system sport a 3-1/2" woofer, while the wider center channel has room for two woofers — one on each side of its centrally located tweeter. 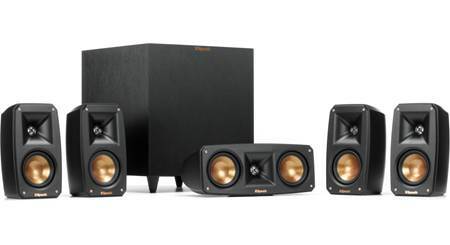 Klipsch knows how much fun it is to have your own home theater. They also know that running a long cable from your receiver to your sub can be challenging. They've equipped this system's sub with a matching wireless transmitter, so you can place it anywhere you have a power outlet and enjoy hard-hitting bass. The included wireless transmitter plugs into the subwoofer output on the back of your receiver (sometimes labeled "LFE," or "Low Frequency Effects"). Simply plug the transmitter and the sub into an AC power source and you're ready to rock. I recommend trying your sub out in a few different spots around the room to see where you get the best performance. After reading the reviews, I decided to purchase it and was truly blown away with the quality of sound. Do the speaker wire connections work with banana plugs? I do not bought the banana plugs. 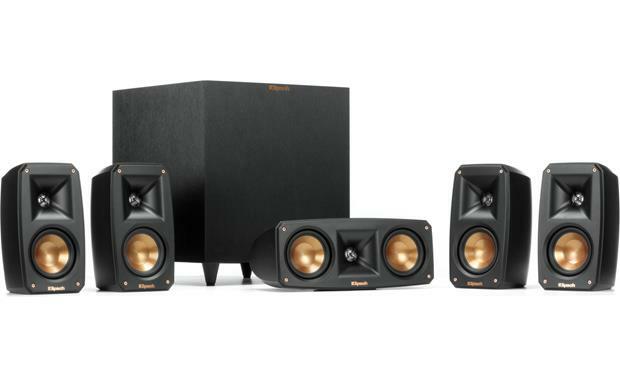 Reference Theater Pack: The Klipsch Reference Theater Pack includes four matching satellite speakers, a center-channel speaker, a wireless powered subwoofer with built-in 2.4GHz receiver, and an external wireless 2.4GHz transmitter. Speaker wire is not included and sold separately (see Accessories tab). 4 Satellites & 1 Center Speaker: The four satellite speakers and one center speaker incorporate Klipsch proprietary speaker technology - including Tractrix horn-loaded LTS (Linear Travel Suspension) tweeters and Copper-Spun IMG (Injection Molded Graphite) woofers. Each speaker also features a rear-firing port, an acoustically transparent magnetic grille, and spring-posts terminals (will accommodate bare wire from 18-14 gauge). 1" Horn-Loaded LTS Tweeter: Each satellite and center-channel speaker utilizes Klipsch's exclusive Tractrix horn technology mated with a 0.75" aluminum tweeter to deliver impressive high-frequency response with greater extension, enhanced imaging and powerful dynamics - creating a clean and natural sound. The square Tractrix Horn delivers a 90° (w) x 90° (h) dispersion pattern for a broader sound-stage. Behind the horn lies a 0.75" aluminum tweeter with a Linear Travel Suspension (LTS) to minimizes distortion for enhanced, detailed performance. 3.5" Copper-Spun IMG Cones: Each satellite speaker features a single 3.5" Copper-Spun IMG woofer, while the center-channel speaker features two 3.5" Copper-Spun IMG woofers. 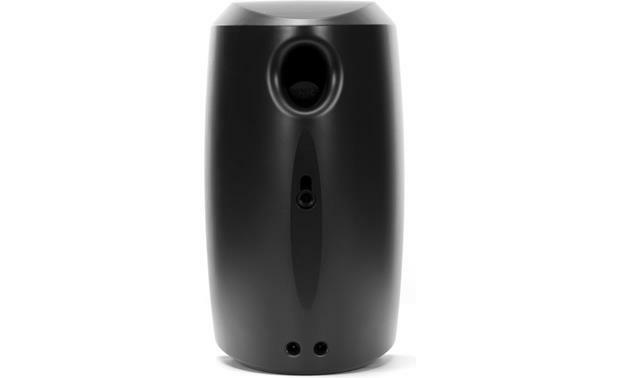 Injection Molded Graphite (IMG) woofers are exceptionally light, while being extremely rigid, providing remarkable low frequency response, with minimal cone breakup and distortion. 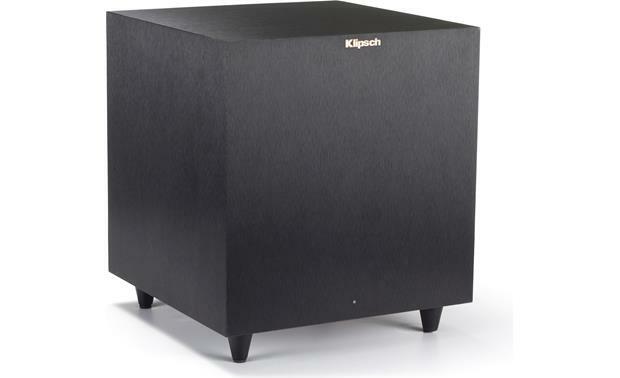 Wireless Powered Sub: Klipsch powered subwoofers are designed to reproduce deep bass and deliver the impact that makes your movies and music come alive. The included wireless powered sub houses a powerful 8" copper-spun IMG (injected molded graphite) down-firing woofer powered by an all-digital 50W RMS (150W Peak) amplifier, plus features a down-firing port for dynamic bass performance. The copper-spun IMG woofer is exceptionally light while being extremely rigid, providing remarkable low frequency response with minimal cone breakup and distortion. The down-firing woofer gives you greater placement flexibility than a down-firing woofer. The wireless powered subwoofer features a durable MDF cabinet that is finished with a brushed black polymer veneer. The MDF enclosure is rigid and protects against unwanted vibration and distortion. Wireless & Wired Connections: The powered sub features a built-in wireless receiver and comes with an external wireless transmitter that plugs into your AV receiver's LFE output. If you prefer a hardwired connection, the powered subwoofer is also equipped with a pair of line-level RCA-type inputs to connect the sub to your receiver or integrated amplifier. 2.4GHz Transmitter & Receiver: Thanks to 2.4GHz wireless connectivity, your receiver can now send its LFE audio signal to the powered sub wirelessly (no subwoofer cable required between receiver and sub). Simply plug the included wireless transmitter into your AV receiver's LFE output to wirelessly transmit the LFE signal to the powered sub's built-in wireless receiver. Wireless range is approximately 30' at CD-quality level. LFE/Stereo Inputs: Most of today's AV receivers have a line-level subwoofer output (LFE). If your receiver has an LFE output, connect one end of a subwoofer cable (sold separately) to this output and connect the other end of the cable into the powered subwoofer's line-level input labeled "L/LFE". Set the powered sub's built-in crossover to "LFE" with this type of connection. In absence of a subwoofer (LFE) output on your receiver, as an alternative hookup, you can connect Left & Right channel pre-amp outputs from the receiver to both the "L/LFE" and "R" inputs on the powered subwoofer. Controls: The level control, low pass crossover, and phase control allow you to blend the powered subwoofer's low-frequency tones with your system's other speakers, as well as establish the ideal level of bass. All controls are found on the rear-panel. Low Pass Crossover: The variable lowpass crossover is adjustable from 40-120Hz. 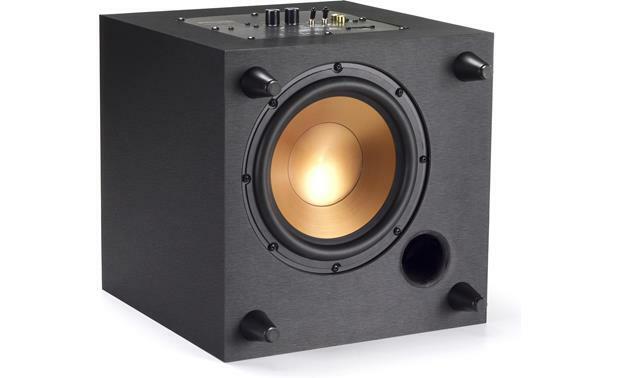 The crossover point chosen determines where low bass frequencies are "handed-off" from the satellites and center speaker to the Klipsch powered subwoofer. Phase Control: This control is used to acoustically match the subwoofer's output to your main speakers. Select the position either 0˚or 180˚ in which your subwoofer has more output at the listening position. Auto Power On/Off: The wireless powered subwoofer will automatically turn On when it senses an audio signal. It will automatically go into "Standby mode" after 15-20 minutes with no audio signal. You can also choose to turn the powered sub On or Off manually from the rear-switch on the back. Notes: Both, the powered sub & wireless transmitter, will require AC power. Satellites & Center Speaker Mounting Options: The satellites and center speaker can simply be placed on stands, a table-top, or shelf. 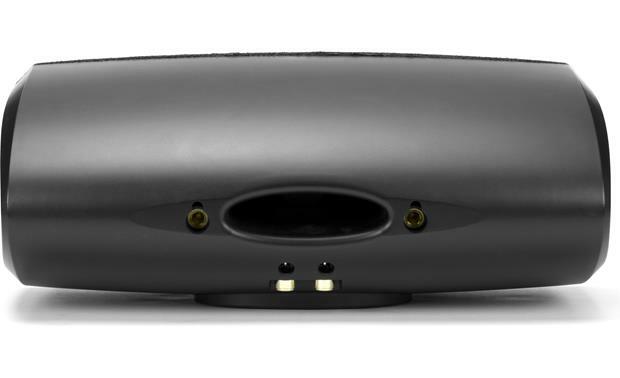 An integrated rubber pad on the bottom of each speaker provides stability and protection. Each satellite speaker also has a rear-mounted keyhole slot (center channel has two keyhole slots) that can be used to mount the speakers on a wall (mounting screws not included). In addition, there is a 1/4"-threaded insert recessed 0.375" behind the keyhole slots to accommodate articulating wall-mount brackets (sold separately - see Accessories tab). Subwoofer Placement: For optimum performance, place your subwoofer in a corner of the room on the same wall as your front channel speakers. Please note that room placement can have a dramatic effect on the performance of your powered subwoofer. Corner placement, as suggested above, will increase the amount of bass output, while placing the subwoofer along the middle of a wall, or out in the room will decrease the amount of bass output. Review states this system is for small and medium size rooms. How many square feet are considered medium size? Are these speakers wired or wireless? 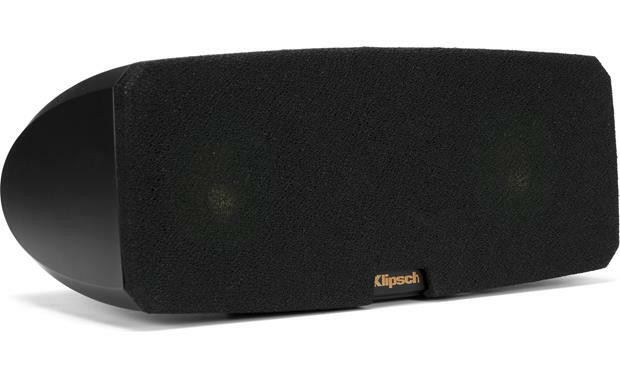 The Klipsch Reference Theater Pack includes four matching satellite speakers, and a center-channel which need to be wired to your receiver/amplifier. However, the powered subwoofer is wireless with a built-in 2.4GHz receiver, and an external wireless 2.4GHz transmitter to plug into your receiver's subwoofer output. Hope that helps! How does this connect with a Samsung UHD television? 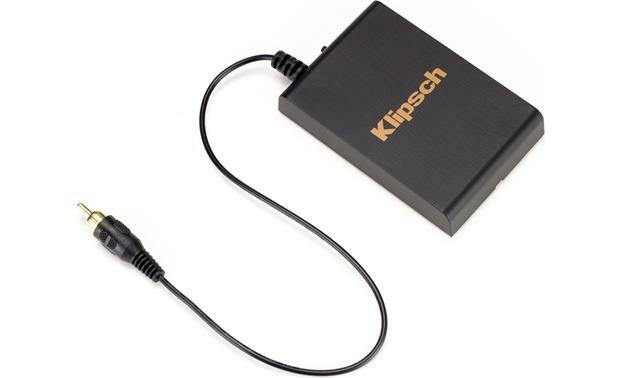 The Klipsch Reference Theater Pack speakers are passive/non-powered speakers that require a receiver to connect your TV audio. For more details or assistance on finding a suitable receiver, please contact an Advisor directly by phone (888.955.6000) or online chat. Thanks! It seems like a 80watt sub would be pretty weak when looking at other sub comparisons. Literally is what's holding me back from this system. Thoughts? I live in an apartment so i am limited to so much volume. But I do want a good, tight sound. And this system will definetly deliver what I need. 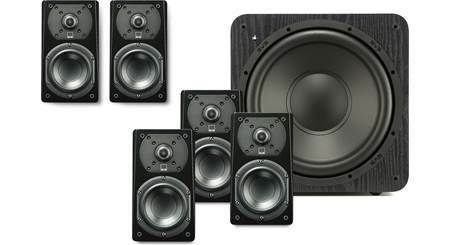 But if you live in a house, and don't have a neighbor issue, you should get their high end systems, they are amazing. 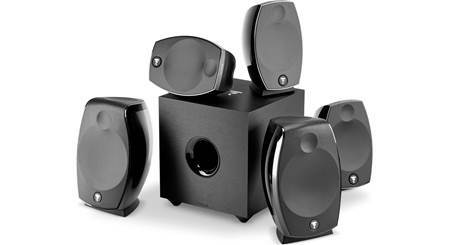 Searches related to the Klipsch Reference Theater Pack 5.1-channel home theater speaker system with wireless powered subwoofer.